These tofu bites are a great pop-in-the-mouth treat. You can double the marinade, reserve it after marinating them, and heat it as a dipping sauce, although they really don’t need it. If you freeze the tofu, then thaw it, the consistency forms a “meatier” texture, however, a long marination still delivers the same amount of flavor. See my note below about pressing tofu if you’re unfamiliar with this (imperative!) step. Put the water, tomato paste, tamari, maple syrup, onion powder, garlic powder, mustard, and cayenne pepper in a shallow bowl. Whisk to combine. 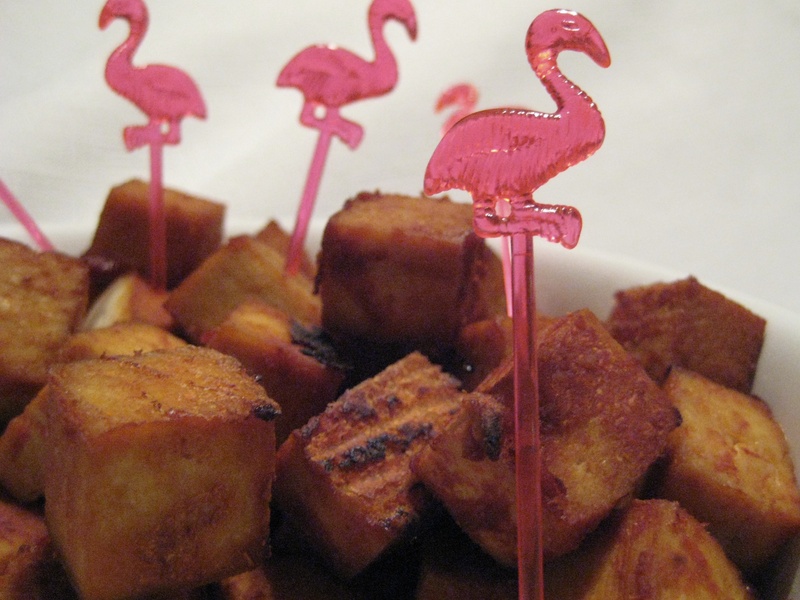 Gently stir in the tofu cubes, cover, and let sit for three to five hours. When you’re ready to bake the tofu, preheat the oven to 375°F (190°C). Cover a baking sheet with parchment paper, and spread the tofu, in a single layer, on the sheet. You can reserve the marinade, if desired, for a dipping sauce. Bake for 30 minutes, turning every 10 minutes. Note: Pressing tofu removes the excess moisture and allows it to absorb the marinade much more efficiently, with a far tastier end product. To do it, layer a cutting board with two layers of clean towels. Top with tofu, and layer with another two towels. Top with a board (I use another cutting board), then put a heavy object on top (like a cast iron pan, or a heavy pot or two) that offers even weight distribution. Allow to press for at least 30 minutes, changing the towels if they become soaked through.